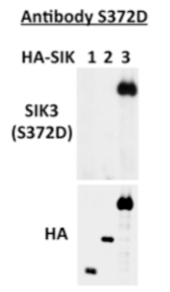 This antibody detects SIK3, but does not detect SIK1 nor does it detect SIK2. This antibody works well with overexpressed protein. This antibody detects SIK3, but does not detect SIK1 nor does it detect SIK2. This antibody works well with overexpressed protein. HEK293 cells were transfected with vectors encoding HA-SIK1, HA-SIK2 or HA-SIK3. Cell extracts were then blotted using the anti-SIK3 (62 - 313) S372D.